This time we focus on oneness with Christ and reconciliation with one another. In the previous post we considered oneness in the church. 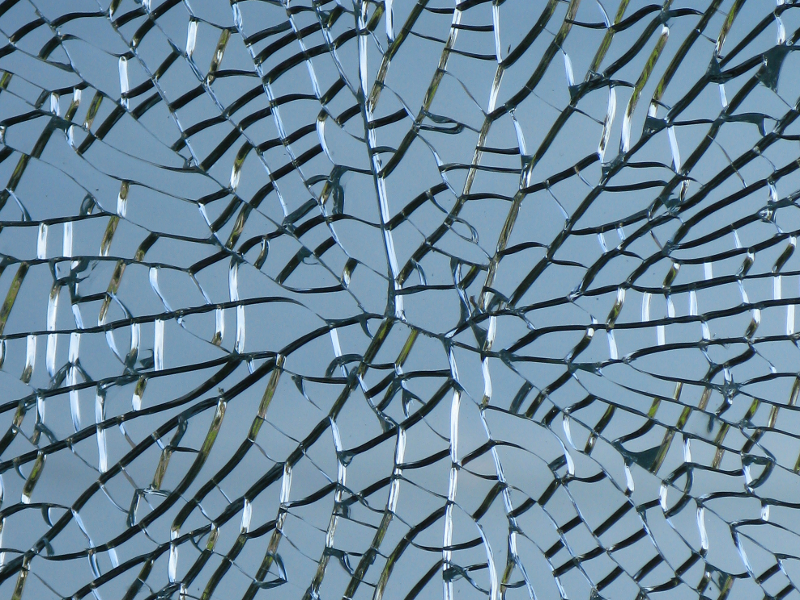 Reconciliation underlies and leads to this, without it the church will remain disjointed. Continuing the series based on revelation at Coventry, this week we look at the second topic - 'Oneness with Jesus and in church life, reconciliation'. As we saw last time, Jesus really is building his church. We need to seize this as a source of supreme hope and comfort at a time when men and women (more often men) have been inclined to take control. Last time we considered the centrality of Christ. 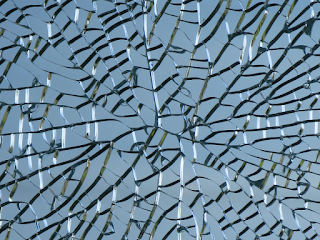 We also took a look at the requirement for unity in the church which his centrality demands. This time we will look at unity again, but this time unity with Christ rather than unity with one another. Both are essential, of course. 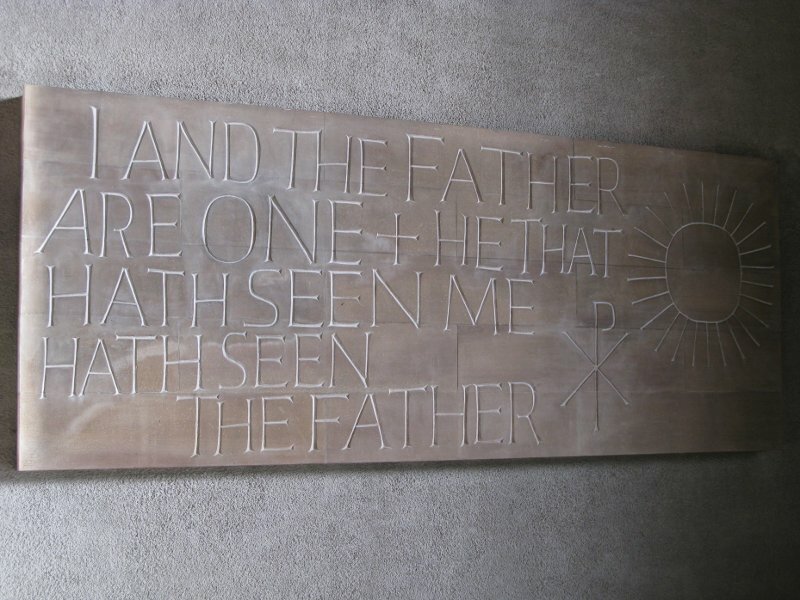 Oneness with Christ - Along the east interior of the new cathedral at Coventry is a series of Bible texts carved on large, stone tablets. One of them is shown in the photo above; it reads, 'I and the Father are one. He that hath seen me hath seen the Father'. These words from John's gospel (John 10:30, John 14:9) spoke powerfully to me. Our oneness with Christ depends utterly on his oneness with the Father. How so? Read the whole of John 10 and then consider these points. In verse 7, Jesus makes it clear that he alone is the way in and out. Verse 8, others who had made this claim were thieves and robbers. To be saved we must enter through Jesus. There's no other way (verse 9). Verse 11, he lays down his life for the sheep. Verse 15, he and the Father know one another. (They are one, verse 30). We know him and he knows us in the same way (verses 14 and 15). And then John 17:20-23 - arguably the most amazing few verses in the entire Bible. Let's be clear. Yahshua says that the glorious Father (the Most High) is in him (Yahshua, Jesus, Isa) and has given the glory to him. He further says that he (Yahshua) is in us and that he (Yahshua) has given the glory to us. In other words the Most High is in us and we have been given the glory. It's all the same oneness, we are included in their oneness. If that doesn't blow you away, nothing will! Reconciliation in church life - In the ruins of the old cathedral is a statue entitled 'Reconciliation'. It represents reconciliation between nations that had been at war, a war that caused the destruction of the cathedral and many other beautiful buildings all over Europe. Millions of lives were lost. 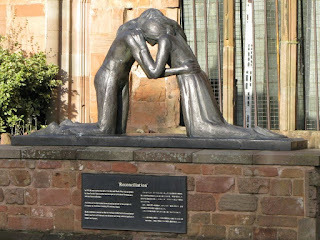 But this sculpture also spoke to me powerfully about reconciliation in the church. Like the sculpture we are surrounded by the wreckage of a broken and fractured building. We need to be reconciled to one another. We saw in the previous part that Yahshua wants us to be one, just as he and the Father are one. The Father, Son and Spirit are three representations of the One. They are three manifestations of the Almighty. In the same way we are to be one. We are all to be representations or manifestations of church. Each one of us is to be representative of the love of Christ, our head. Unlike the Father, Son and Spirit we can be seen as many disconnected individuals, or many sub-groups within the church. But this is not how we are meant to be. Instead we are supposed to be one body to which Christ will be attached as our one head. So you see why reconciliation is so important. Yahshua came to reconcile us with the Almighty, but he also came to reconcile us to one another. That is why the fruit of the Spirit is a reconciling fruit. Think about it! What are the characteristics of this fruit? They are love, joy, peace, patience, kindness, goodness, faithfulness, gentleness and self-control (Galatians 5:22-23). It's the fruit of Jesus in our lives, it's the fruit of the Father. We are grafted in to the Son. Our Father, the gardener, did that work. Read John 15. It's time to recognise our need for reconciliation to one another, and we will have to recognise it in our hearts, not merely as an intellectual exercise in our minds. It goes without saying that we should have the mind of Christ in this, but we also need his heart towards one another. Every tiny, little step you can take towards reconciliation with a brother or sister or with a denomination or group (every little step) is a step towards oneness and the fulfilment of Jesus' mission. Every angry word, lack of patience, every unkindness is a step away from that supreme goal. I have been guilty of that so often. It is impossible to have oneness without reconciliation. So hold nothing back in your striving for reconciliation! Ask Father to give you more and more of the reconciling fruit of the Holy Spirit in your life. It's the only fruit that has the flavour and aroma of the Father's love, made manifest in Christ our Lord and King. UK Fellowship Friday Blog Hop - This blog hop is for Christians who live in the UK to link to a post you have recently written that might encourage other Christians. Started by Rhoda, please visit her original article.